There is a lot of ambivalence and controversy swirling around vitamin B17—is it beneficial to your health or pure poison? Considered persona non grata in the 1980s, the FDA banned the controversial drug due to its toxic affect. First, to lift a veil off of Vitamin B17, it is important to know that it is not actually a vitamin. 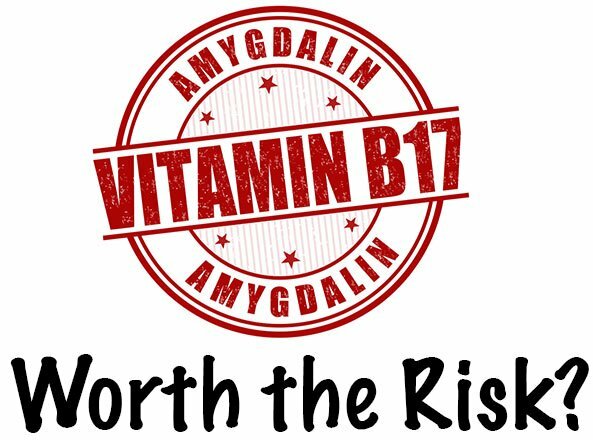 B17 is a natural substance called laetrile, which was then formatted into the discredited cancer drug called amygdalin. Laetrile can be found naturally in the seeds of almonds, apricots, and peaches. Despite its being banned from the FDA, some alternative medicine practitioners claim that vitamin B17 is not only an effective alternative treatment to cancer, but that it contains some other health benefits as well. Below, we will venture into the controversial world of B17 and examine both sides of the spectrum: is B17 beneficial or hazardous to your health? Because vitamin B17 is not essential and not an actual vitamin, many experts believe that taking a vitamin B17 supplement is not worth the risk. Vitamin B17 is controversial due to its potential toxic effects to your body in that the body converts laetrile into cyanide. Several cases of cyanide poisoning have been linked to the substance. There are some circumstances that can increase vitamin B17’s potentially hazardous effect to your health. Some cases have found that taking high doses of vitamin C along with vitamin B17 increases the cyanide effect of the substance in question. Another concern lies in taking vitamin B17 orally because intestinal bacterial in the gut increases the cyanide effect of vitamin B17 and amps up its toxicity. One way to get around this negative effect is to have the substance injected as opposed to taking it orally. Some experts recommend getting your dose of vitamin B17 via diet, as opposed to taking a supplement. This is because there are smaller amounts of B17 found in food and therefore less likely to have a toxic effect. So with the concerns listed above, why bother taking something so potentially dangerous? Some health practitioners believe that when taken in smaller doses (usually via diet) and carefully, vitamin B17 is not only safe, but beneficial to your health. Listed below are some of these claims. As initially pointed out, vitamin B17 was once a prescribed cancer treatment until its banning in the 1980s. Today, studies concerning vitamin B17 are all over the board. Some studies claim that vitamin B17 is an effective way to prevent cancer while inhibiting the proliferation of cancer cells. Other studies find no evidence supporting these claims. Despite these mixed claims, many health practitioners still believe that vitamin B17 is a great supplemental treatment for cancer, but it should by no means be the only cancer treatment. The studies supporting the use of vitamin B17 as a sidekick treatment have found that the substances that comprise vitamin B17 help diminish and suppress the growth of cancerous cells and tumors. It is especially considered to be effective because it displays a selective eliminating effect of the cells, only killing off the mutated cancerous cells, while leaving the normal, healthy cells alone. One particular study conducted in South Korea found that this was especially true in the treatment of prostate cancer. The bottom line of this study was that it is a possible effective natural treatment for prostate cancer. Some animal studies have found that under certain circumstances, this selective killing technique was effective in killing off cancerous cells in brain tumors and in the bladder. Other studies focusing on treatments for breast and lung cancers found no effect. Despite all of the research done on vitamin B17 and cancer, experts still remain split on the issue. There has been discussion over the reactions and effects vitamin B17 produces within the body, however, it is not all bad. Some experts believe that vitamin B17 may decrease blood pressure by stimulating the production of thiocyanate. Thiocyanate is a natural yet powerful agent in lowering blood pressure. Despite this claim, experts are still unsure if this a lasting effect or just a short term solution. This alternative treatment should not be considered if you are already taking blood pressure medication or any heart medications for that matter. Experts also warn against taking this supplement if you have any pre-existing heart conditions as experiencing a sudden drop in blood pressure could prove to be dangerous. Its already widely believed that vitamin B17 inhibits and stops the growth of cancerous cells and this effect is believed to be the same for the spread of illness by inhibiting the growth of harmful cells. Despite these claims, experts aren’t fully sure why this occurs. One study found a potential explanation in that vitamin B17 potentially supports the immune system by increasing a person’s white blood cell count. White blood cells are important because they attack dangerous cells and infection; helping to restore and protect our health. Another explanation is that vitamin B17 has a potential detoxifying effect in the liver. By supporting the functioning of the liver, the body is better able to rid the body of toxins and other harmful substances. Detoxing the liver and providing support ensure that these harmful substances don’t spread out into the body and cause disease and infection. Some experts believe that the cyanide effect that occurs in the body when taking higher doses of vitamin B17 may actually kill off mutated cells by increasing the acid content of the tumors and effectively destroying them and inhibiting their growth. If you are curious about the benefits of vitamin B17, but don’t want to risk taking a supplement, you can find the substance naturally occurring in many foods. The highest concentration of naturally occurring vitamin B17 can be found in bitter almonds and apricot kernels, which are actually used to create the extract for the supplement. Vitamin B17 can actually be found in nearly all kernels and seeds known to produce vitamin B17, such as apple seeds. Whole grains and beans are also another way to incorporate vitamin B17 into your diet. Despite knowing where to find natural sources of B17 in terms of diet, it is uncertain how much B17 is actually contained in these foods. Levels of vitamin B17 vary depending on how and where the seeds, fruit, and veggies are grown. Vitamin B17 can also be taken in the form of a pill or an injection. However, due to the banning of this substance, obtaining and purchasing this supplement is considered illegal. While we wanted this article to be useful for people curious—the risks of B17 are not worth any potential rewards. Right now, there is no established dosing recommendations from the USDA and its banned by the FDA. There are a lot of good herbs and supplements that do have clear health benefits and nowhere near the side effects.